An Afghan policeman turned his rifle on his colleagues at a checkpoint in southern Helmand province, killing 11 of them before fleeing the scene, officials said Tuesday. The attack happened late on Monday night in Lashkar Gah, the provincial capital, said Omer Zwak, spokesman for the provincial governor. The attacker collected all the firearms and ammunition from his colleagues, then fled the scene in a police vehicle — presumably to join the Taliban. “An investigation is underway,” Zwak added. Dr. Din Mohammad at the Lashkar Gah Hospital said the hospital morgue received 11 bodies of slain policemen, all with gunshot wounds. The Taliban made no official statement or claim about the attack but Afghanistan has seen several such incidents over the past years, cases in which Afghan troops or policemen — or Taliban militants dressed in Afghan uniforms — turn their guns on their colleagues or U.S.-led coalition partners. 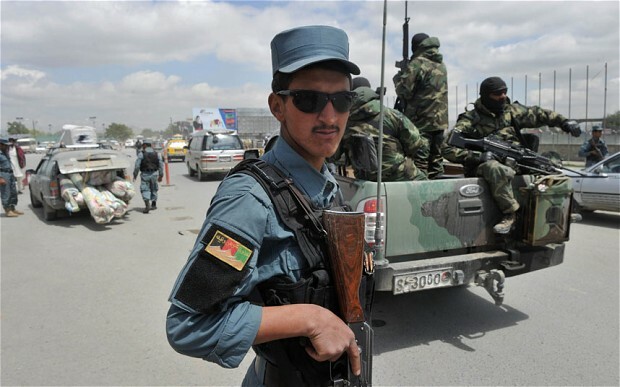 Earlier this month, an Afghan policeman turned his rifle on his colleagues in northern Faryab province, killing eight of his fellow policemen as they were sleeping in an outpost in the district of Almar. He then collected all their firearms and fled the scene. In another similar incident, a member of a state-backed militia shot and killed five fellow militiamen in December in northeastern Kunduz province. The attacker, who was on guard duty, shot and killed his colleagues as they were sleeping, then made off with weapons and ammunition. And last October, a U.S. soldier and an American civilian contractor were killed when an Afghan man in army uniform opened fire on them inside a military base in the capital, Kabul. The attacker died in a subsequent shootout with other U.S. and Afghan forces.